N.B. : A few minor changes have been made to the original text to emphasize a few points and to correct a few typographical errors. Today King David reminds us that God has made a home for the poor (cf. Psalm 68:11). Looking around the world today - and since the time David composed these lines - the cynic, seeing so many poor and homeless among us, might well ask where this home is. But this very question fails to understand the ways of the Lord, which are very much unlike our own (cf. Isaiah 55:8). We should first consider who it is who is poor, that is, of whom did David speak when he spoke of the poor? They are the widows and the orphans, the forsaken and the imprisoned, those who are dependent on others (cf. Psalm 68:6-7). Yet we know the Lord’s mercy is not reserved only for these four particular groups because in the Book of Sirach we are instructed to “humble [ourselves] the more, the greater you are, and you will find favor with God” (Sirach 3:17-18). The humble, then, can also be counted among the poor, among the poor in spirit because “the kingdom of heaven is [theirs]” (Matthew 5:3). To be poor isn't, in and of itself, sufficient to enter into the home made by the Lord. It is the humble who find favor with God and it is quite possible to be poor and yet arrogant, just as it is possible to be rich and humble. Certainly each of us can be humble, each of us can acknowledge our dependence on the Lord, each of us can find favor with God; if this is so, each of us can also receive a home from the Lord. How, then, do we become humble? How do we receive this home? Most high, glorious God, enlighten the darkness of my heart, and give me, Lord, a correct faith, a certain hope, a perfect charity, sense and knowledge, so that I may carry out Your holy and true command. In these simple and yet profound words, Saint Francis reveals the humility of his heart. He recognizes that he is a sinner who does not have all of the answers and who is in need of conversion; in short, he acknowledges that he is dependent on the Lord. It was his experience before the Cross that allowed Saint Francis to recognize that, as he said, "Blessed is the servant who esteems himself no better when he is praised and exalted by people than when he is considered worthless, simple, and despicable; for what a man is before God, that he is and nothing more," a maxim he never tired of repeating to all who would listen. Are we willing to hear his words? Are we willing to acknowledge that we, too, are only what we are before God and nothing more? Are we willing to acknowledge that we are dependent entirely on God? Be conscious, O man, of the wondrous state in which the Lord God has placed you and formed you to the image of His beloved Son according to the body, and to His likeness according to the spirit. And [yet] all the creatures under heaven, each according to its nature, serve, know, and obey their Creator better than you. And even the demons did not crucify Him, but you together with them have crucified Him and crucify Him even now by delighting in vices and sins. We cringe at these words because we do not want to acknowledge "that nothing belongs to us except our vices and sins.” Standing before God, beholding his glory, gazing upon his holiness, and seeing the loveliness of his face, how can we not see our own sinfulness and the fact that we are not always very lovely? All of this Saint Francis saw in the image of Crucified Love, but he also saw something more: he saw the depths of the Lord's mercy for all who embrace a life of penance and embark on the journey of conversion. Of these disciples, Saint Francis said, "we have nothing else to do except to follow the will of the Lord and to please him." The way of humility is found in the following of this path that Saint Francis trod so very well, "to follow the teaching and the footprints of our Lord Jesus Christ." Now that we have seen the way to become humble, to become poor, we can ask what home the Lord has made for the poor. Some light can be shed on this question by looking to the example of the Lord, who said of himself: “Foxes have dens and birds of the sky have nests, but the Son of Man has nowhere to rest his head” (Matthew 8:20). Given his lack of concern for a home of his own, it would seem odd for him "who was a poor man and a transient and lived on alms" to be overly concerned about homes for others. What, then, does the Psalmist mean? Where – or, better, what – is this home for the poor? King David hints at our answer when he sings, “The father of orphans and the defender of widows is God in his holy dwelling” (Psalm 68:6). In the mind of David, God’s dwelling is his Temple in Jerusalem, for in another Psalm, he sang, “I rejoiced when they said to me, ‘Let us go to the house of the Lord.’ And now our feet are standing within your gates, Jerusalem” (Psalm 122:1-2). Yet the Temple in Jerusalem can only be an image, a foreshadowing, of the true dwelling place of God because the Son of Man declared with great solemnity, “Destroy this temple and in three days I will raise it up” (John2:19). Saint John explains these words of the Lord when he says, “But he was speaking about the temple of his body” (John 2:21). So, then, the home for the poor made by the Lord is not the Temple, but is Christ himself. How can this be? How do the poor enter this home, and what do they find therein? The son of David, King Solomon, hints at the entry into this hidden home when he sings of a dove who makes its home in the clefts of a rock: “My dove in the clefts of the rock, in the secret recesses of the cave, let me see your face, let me hear your voice, for your voice is sweet, and your face is lovely” (Songof Songs, 2:14). As the dove makes its home in the openings of the cliffs, so we are called to make our home in the openings in the Lord’s body. What do I mean? When the Risen Lord showed himself to the Apostle Thomas, he said to him, “Put your finger here and see my hands, and bring your hand and put it into my side, and do not be unbelieving but believe” (John 20:27). The Savior was not simply inviting Thomas to curiously examine the holes of the nails, to verify their existence in some scientific, disinterested way, but to enter into them, to make his home in them and to find in them the peace that only the Lord can give (cf. John 14:27). First, to show that he had truly risen, and to take away from us all doubtfulness. Second, so that the dove (the Church or the faithful soul) might build her nest in his wounds, as in the clefts of the rock, and hide from the eyes of the hawk that schemes to catch her. Third, to print the signs of his Passion as seals upon our hearts. Fourth, to ask us to share in sufferings, and never again to crucify him with the nails of sin. …the first is that during my life I may feel in my soul and in my body, as much as possible, that pain which You, dear Jesus, sustained in the hour of Your most bitter passion. The second is that I may feel in my heart, as much as possible, that excessive love with which You, O Son of God, were inflamed in willingly enduring such suffering for us sinners. So it was that he received the grace of the Stigmata, so beautifully depicted for us in this basilica by Giotto; so fully had he entered into the wounds of his Lord and made in them his home that he became the image of Christ, both in his body and in his spirit. Each of us is called by the Lord to imitate Saint Francis in this way; we, too, are invited not simply to inspect the wounds of the Savior, but to plunge ourselves into them. Jesus says to us, “Come, feel my wounds, for my mercy is tangible. Come, see the wound in my side from where my love flowed out for you, for my mercy is visible. Come, take shelter within my wounds and let my love and mercy wash over you and surround you and give you peace.” We can have confidence that the home made by the Lord for the poor is found in His wounds because King David also sang to God, “Blessed the man who finds refuge in you, in their hearts are pilgrim roads” (Psalm 84:6). Dear friends, as we seek to enter into the mystery of the Lord’s love for us with great humility, following after Saint Francis, let us strive to heed these words of The Poverello: “Therefore, hold back nothing of yourselves for yourselves so that He Who gives Himself totally to you may receive you totally.” In this way, may we live in humility and so find favor with God in the home he has prepared for us. Amen. Saint Francis of Assisi, The Prayer Before the Crucifix. In Francis and Clare: The Complete Writings. Regis J. Armstrong, et al, eds. (Mahwah, New Jersey: Paulist Press, 1982), 103-104. Saint Francis of Assisi, Admonitions, XIX.1-2. In ibid., 33. Ibid., V.1-3. In ibid., 29. Saint Francis of Assisi, The Earlier Rule, XVII.7. In ibid., 123. Ibid., XXII,9. In ibid., 127. Ibid., I.1 In ibid., 109. Ibid., IX.5 In ibid., 117. Saint Anthony of Padua, Sermon for the First Sunday After Easter, 8. Saint Francis of Assisi, in The Little Flowers of St. Francis, 190-191. Saint Francis of Assisi, A Letter to the Entire Order, 29. In Francis and Clare, 58. 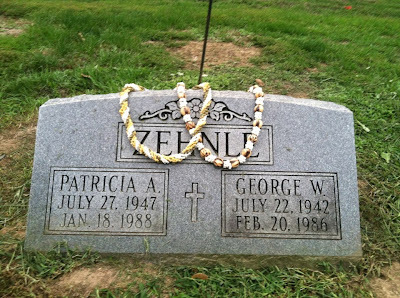 Through the course of human history there arose the custom of leaving a token of gratitude or of love at the graves of loved ones. In much of the western world, it has been customary to leave a bouquet of flowers, though the custom of leaving small statues of various creatures and even wind chimes has recently been introduced. 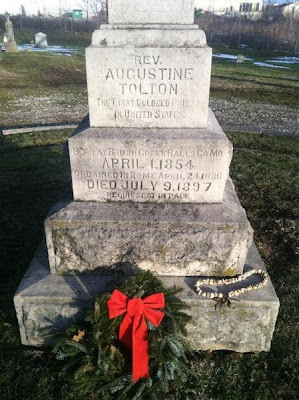 Such a custom of leaving gifts likewise arose around the tombs of the Saints and particular places associated with their lives (and with their deaths), especially in response to answered prayers or as signs of particular devotion. Two days later it seems Saint Francis found a way to give a gift to me. Over the course of this past week, I have taken my meals at a table next to a very nice couple from Sienna, who, to my great surprise, knew of and have visited the shrine of Saint Galgano (it's just a short distance from Sienna), which I very much want to visit. Wednesday evening, after spending some time chatting about the saint, and about other things medieval, ancient, and architectural, and a shared love of books, I told them about my recent experience in the Cathedral of San Rufino. They asked when I would be celebrating Mass and became excited when I told them I would be celebrating Mass this Sunday in the Upper Basilica of Saint Francis of Assisi, until I told them it was the "English" Mass; apparently they meant Mass celebrated in Italian. I told them that I was not yet comfortable enough with my command of Italian to celebrate the Mass publicly in Italian, so instead they asked if I would pray the rosary with them with Italian. I gladly agreed and we arranged to meet in the chapel Thursday morning before breakfast. Fumbling back and forth with my Italian prayer book in one hand and my rosary in the other, we meditated together on the mysteries of the life of the Savior through the eyes of his mother. It may be a simple token, but it touched my heart. The couple has now departed Assisi to return to their home. Over the next several years we intend to stay in contact and I certainly plan to visit them when I make a little pilgrimage to the shrine of St. Galgano. Assisi has an odd way of bringing people together and of helping to form friendships based on a mutual love of the faith of Jesus Christ. Truly, it is good to be here! Life is filled with any number of odd sights. As I made my way to class this morning, I took my usual route of the Via Cyprese, so named for a Cypress tree that stands at the landing of a rather long flight of steps. Because of the large quantity of pigeons that make this Via their home, one of the seminarians referred to it as "Pigeon Alley." This morning I found myself behind a pigeon making its way up steps, not with its wings, but by hoping up one step at a time. It was both a baffling sight and a very humorous one. As the pigeon turned the corner out of sight, I continued laughing and pondered how often pigeons hop up stairs, and why. If I had wings, I would certainly use them. Before I knew it, the pigeon was flying back down the stairs at me in quite a hurry. Being a narrow Via, I wasn't sure how to avoid being hit by the pigeon, when at the last moment it flew over my head. Again, I found myself pondering what had happened, when suddenly a dog came bounding down the steps with a happy look on its face. I wonder if such happenings will continue throughout the day. The great medieval festival in honor of Saint Rufino is still being held here in Assisi; I believe it concludes tomorrow. As part of the day's festivities, Bishop Sorrentino blessed two new members of the Balestrieri di Assisi, that is, two new crossbowmen for the city. The ceremony began with a procession from the Piazza del Comune to the Cathedral of San Rufino, led by the Tamburini di Assisi, the drummers, who were followed by what might be called the color guard (I don't yet know the name for them in Italian), and various men and women of the Compagnia Balestrieri di Assisi. His Excellency celebrated Mass, which I and two other priests concelebrated. As the Sanctus began, the Master of Ceremonies leaned over to me and asked if I spoke Italian (I had been making use of the assistance of a small Missal of sorts). Not thinking much of it, I answered, "Un poco" (a little). As a former Master of Ceremonies, if a priest would have told me he spoke "a little" English, I would not ask him to take a part of the Eucharistic Prayer; suffice it to say that this particular MC did not think like me. It wasn't long before a server was holding a microphone at my mouth and the MC pointed to the appropriate text for me to recite. I was caught a bit off guard and stumbled with a couple of words, but I think I did decently well for my first time, thanks be to God. After the Mass, and a bit before, really, I was able to visit with a former parishioner and her husband who have been vacationing in Italy. It was the first of what I hope will be many visits from friends and family. In certain segments of the Catholic world, Sr. Ilia Delia, O.S.F. is being criticized for, among other things, these words: "This is nothing more and nothing less than the most awesome vocation, and that is to give birth to God." N.B. : Before I continue, let me say - though it really shouldn't be necessary - that I am in full support of the delicate work of Archbishop J. Peter Sartain, Bishop Leonard Blair, and Bishop Thomas John Paprocki as they carry out the task entrusted to them with the Doctrinal Assessment of the Leadership Conference of Women Religious. This work is vital to the mission and unity of the Church. Let me also say that I do not know Sr. Ilia, nor have I read the full texts of anything she has said at the meetings of the L.C.W.R., either this year or in years past. I have, however, read two of her books, Franciscan Prayer and The Humility of God: A Franciscan Perspective and a couple of her articles published in The Cord, though it has been some years ago. I have not read any of her more specialized works. Now, to the question at hand: What does it mean "to give birth to God"? We know that Jesus never said anything without purpose and that, as Saint Bonaventure is continually reminding us, everything Jesus said and did he said and did to teach us. So it is that we must carefully consider his words and actions, seeking to take from them whatever lesson he wishes to impart. A similar incident is recorded by the Evangelists Matthew, Mark, and Luke. The Lord is speaking to the people when the Blessed Virgin Mary and his brethren draw near to speak with him (cf. Matthew 12:46; Mark 3:32; and Luke 8:19). When this related to him, Jesus says to the crowd, "Here are my mother and my brethren! For whoever does the will of my Father in heaven is my brother, and sister, and mother" (Matthew 12:50; cf. Mark 3:34-35 and Luke 8:21). If Jesus says that some from whom he has not received human flesh - that is, Mary, the Mother of God - are his mothers, we have to take him seriously and seek to discern what it is that he means by the use of this word. If a woman is a mother because she gives birth to a child and Jesus refers to those who do the will of the Father as his mothers, then speaking of "giving birth to God" should not seem so unusual, properly understood. I do not know the context in which Sr. Ilia made the above statement, nor does it seem the various bloggers do, either. What I do know, however, is that Saint Francis of Assisi made a brief and insightful comment on these words of the Savior. They are children of the heavenly Father (cf. Mt 5:45) whose works they do, and they are spouses, brothers, and mothers of our Lord Jesus Christ (cf. Mt 12:50). We are spouses when the faithful soul is joined to our Lord Jesus Christ by the Holy Spirit. We are brothers to Him when we do the will of the Father who is in heaven (Mt 12:50). [We are] mothers, when we carry Him in our heart and body (cf. I Cor 6:20) through divine love and a pure and sincere conscience and [when] we give birth to Him through [His] holy manner of working, which should shine before others as an example (cf. Mt 5:16) (7-10. In Francis and Clare: The Complete Works, Regis Armstrong, et al, ed. [Mahwah, NJ: Paulist Press, 1982], 63, emphasis mine). We are spouses when the faithful soul is joined to Jesus Christ by the Holy Spirit. We are brothers when we do the will of His Father Who is in heaven (cf. Mt 12:50). [We are] mothers when we carry Him in our heart and body (cf. I Cor 6:20) through love with a pure and sincere conscience, we give birth to Him through [His] holy manner of working, which should shine before others as an example (cf. Mt 5:16) (51-53, in Ibid., 70, emphasis mine). 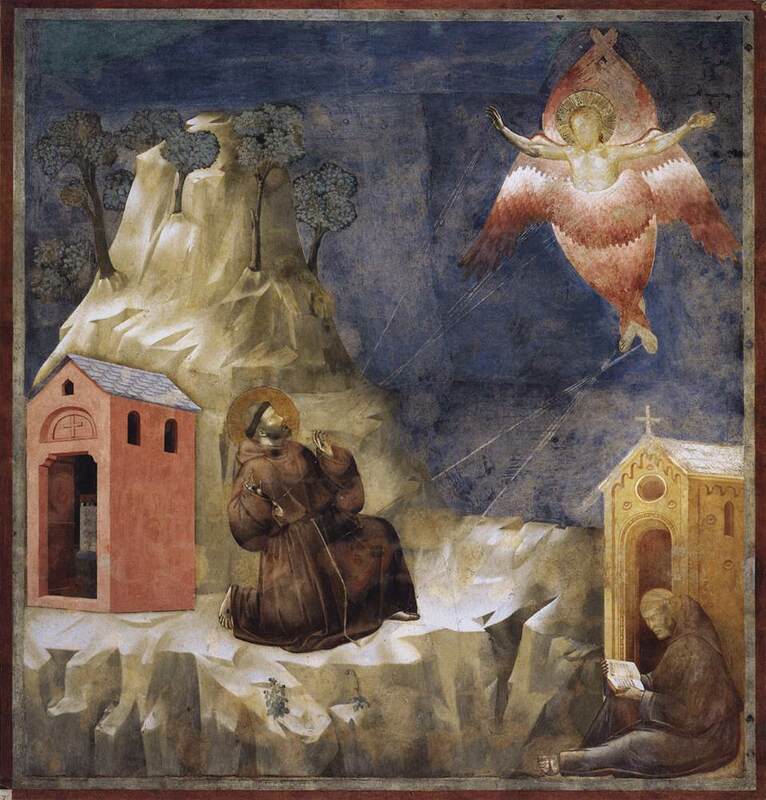 In Saint Francis' view, then, we give birth to Jesus by imitating him. When others see the example of one who loves the Lord Jesus Christ, who leads a life of penance, who follows the Father's will, then the example of their life can give birth to Christ in another person's life so that they, too, can come to know, love, and serve the Lord. Saint Francis so conformed himself to Christ the Lord that he received the sacred stigmata, the very wounds of the Crucified, in his own body; it was said while he lived that Francis truly became another Christ. Because he imitated Christ so perfectly, he made Christ known wherever he went, in such a way that could not be doubted. In this way, he gave birth to Christ in the lives of others and this is, certainly, the highest vocation that we have; whenever we help others to encounter Christ by the witness of our lives, we, too, give birth to him. This is, of course, not meant literally, but metaphorically; it really is that simple. If Sr. Ilia is foolish and wrong for speaking about giving birth to Christ, then so is Saint Francis of Assisi, who gladly made himself the fool of God. I hope that this post will not be twisted in an attempt to claim that I support the LCWR in its seeming efforts to resist the work of the Archbishop and Bishop Delegates; it is certainly not that. What needs to be criticized can be criticized, but charitably. Mocking a phrase found in the tradition of the Church because one does not personally like it or understand it is not helpful. The Twitter feed is back! Sometime ago - quite a long time ago, actually - the Twitter feed I had posted to the right sidebar vanished without an explanation. When I first noticed it, I was not immediately able to remedy the situation through Blogger. For whatever reason, it occurred to me a short while ago that I still had not restored the disappeared feed. I'm happy to say that you'll now find my Twitter feed just down a bit in the right sidebar. If you don't already follow me on Twitter, you may do so @daren_j_zehnle, or you can simply check back here. My Twitter feed is more or less active each day, mostly with retweets of important news items. This morning I received the shocking news that Deacon Frank Maynerich and his son Paul were killed last night in an automobile accident when an oncoming vehicle failed to stop at a stop sign. Deacon Frank is a man whom I deeply admire and respect and who was very good to me when I was Pastor of his home parish, a man who was deeply devoted to his wife, to his family, and to God and the Church. He is surely already missed very greatly. I want very much to be with his family and with Sacred Heart Parish, to embrace them, to comfort them and cry with them, but I am more than an ocean away. Never before in my 35 years of life have I been unable to grieve with my closest friends and the families of those who have died. Previously, it was always possible, through the kindness of others, for me to pray and mourn with the family and friends of those who had died, but now it is simply not possible. I find myself rather unsettled and uncertain of how to process my emotions so far from home and all that is familiar; it is an uncomfortable feeling with which I must now wrestle, but I am confident Saint Francis of Assisi will prove an able guide and companion as he has often done in the past. In this initial moment of grief, my thoughts turn to the wisdom of the Poverello and to that of his spiritual son, Saint Bonaventure. It was only last night that I read these words in one of Bonaventure's sermons: "Nothing is lost with great sorrow that is not possessed with great love" (Sermon within the Octave of Epiphany, 2). While it is true that we certainly do not possess those we love, the sorrow we feel at their passing from this life is great because of the love we bore and still bear for them. The sorrow we feel, then, is painful, yes, but it is also a source of comfort. Second, I cannot help but recall one of the praises of Saint Francis: "Praised be You, my Lord, through our Sister Bodily Death, from whom no living man can escape. Woe to those who die in mortal sin. Blessed are those whom death will find in your most holy will, for the second death shall do them no harm" (The Canticle of Brother Sun, 12-13). Please, join me in praying for the repose of the souls of Deacon Frank and Paul and for the consolation of their family and friends. Update: WICS has a brief news article about the accident. Assisi celebrates today the Solemnity of San Rufino, the first Bishop of the city, who converted the ancient Roman city to the faith of Jesus Christ in the 3rd century. Because his preaching met with such great success, he seems to have been martyred in, or about, the year 238 at Costano. According to tradition, a great stone was tied about his neck and he was tossed in the river Chiascio. More than this cannot be said with any certainty. It is striking being in this City of Peace so renowned for the lives of her two most famous citizens, Francis and Clare, celebrating the life and witness of a saint who is so often overlooked, those his body is also enshrined in the city. One might dare to say - with no little trepidation - that his life should at least be celebrated as much as much as those of Francis and Clare, and perhaps even more so because he gave his life for the sake of the Gospel. The procession first made its way to the Church of Saint Clare, where it stopped for a brief few moments of prayer before continuing its to the Piazza del Comune at the center of town. There, the Most Reverend Domenico Sorrentino, Archbishop of Assisi, encouraged and exhorted the pilgrims and blessed the city. The procession then made its way back to the Cathedral where Archbishop Sorrentino again blessed the pilgrims, after which a band played outside in the piazza as the pilgrims enjoyed pastries. The festivities will conclude this evening with a concert of sacred music in honor of Saint Rufino. Saint Rufino, pray for us! Here in Assisi, today is not simply the Memorial of Saint Clare, but the Solemnity of Saint Clare, which trumps even the Nineteenth Sunday of Ordinary Time in the church dedicated to her honor and memory. So it was that this morning I had the privilege of concelebrating the Holy Mass with His Eminence Paolo Cardinal Sardi - Cardinal Patron of the Sovereign Military Hospitaller Order of St. John of Jersualem, of Rhodes, and of Malta - His Excellency the Most Reverend Domenico Sorrentino, Archbishop of Assisi-Nocera Umbra-Gualdo Tadino, and a good number of priests belonging to several of the Franciscan Orders. As might be expected, the church was packed with pilgrims from Assisi and throughout Italy, and many other places besides. The number of people was so great that there was, quite literally, standing room only and the congregation had to squeeze together to allow the procession of ministers to enter the church and to leave at the conclusion of the Mass. The choir, composed from what I could tell only of members of the laity, did a superb job and sang with obvious emotion, grateful to God for the gift of the Abbess of the Poor Women. Approaching the altar, I became aware again of just how small I am. Being perhaps all of 5'8.5" and of slender build, I am generally aware of my own littleness but on some days this awareness is heightened (pun intended). The priests reverenced the altar "from the front," that is, from the side nearest the faithful. The free-standing altar is raised up on a platform that has a steps only from the side of the altar furthest from the people (so there are no steps on the front side). Generally when a priest or deacon reverences the altar with the kiss, he has to make a profound bow from the waist to do so. Today, though, I needed only to nod my head slightly to kiss the altar. I felt very much like a child approaching his father. To remember our own littleness in the presence of God is no small thing; it is truly right and just that we do so, for in the contemplation of our smallness we cannot help but contemplate also, as Saint Clare says, the greatness of God "Whose power is stronger, Whose generosity is more abundant, Whose appearance is more beautiful, Whose love more tender, Whose courtesy more gracious, in Whose embrace you are already caught up" (The First Letter to Blessed Agnes of Prague, 9-10). In that brief moment I gave thanks to God for his gift of the Priesthood of Jesus Christ, which he has deigned to bestow upon me, unworthy though I am. It was a moment of great profundity and simplicity, which seems quite in keeping with the spirituality of Saints Francis and Clare. It is our smallness, our frail human nature that becomes an appeal to the Lord’s mercy, that he may show his greatness and tenderness as a Father, helping, forgiving us and saving us. And God responded to our plea by sending his Son who died and rose for us; he entered our frailty and did what man on his own could never have done: as an innocent lamb he took upon himself the sin of the world and reopened our path to communion with God, making us true children of God. It is there, in the Paschal Mystery, that the definitive face of the Father is revealed in its full splendour. And it is there, on the glorious Cross, that God’s omnipotence as the “almighty Father” is fully manifested (General Audience Address, 30 January 2013). See, daily He humbles Himself as when He came from the royal throne into the womb of the Virgin; daily He comes to us in a humble form; daily He comes down from the bosom of the Father upon the altar in the hands of the priest. And as He appeared to the holy apostles in true flesh, so now He reveals Himself to us in the sacred bread. And as they saw only His flesh by means of their bodily sight, yet believed Him to be God as they contemplated Him with the eyes of faith, so, as we see bread and wine with [our] bodily eyes, we too are to see and firmly them to be His most holy Body and Blood living and true. And in this way the Lord is always with His faithful (The Admonitions, I.16-22). God’s sign is simplicity. God’s sign is the baby. God’s sign is that he makes himself small for us. This is how he reigns. He does not come with power and outward splendour. He comes as a baby – defenceless and in need of our help. He does not want to overwhelm us with his strength. He takes away our fear of his greatness. He asks for our love: so he makes himself a child. He wants nothing other from us than our love, through which we spontaneously learn to enter into his feelings, his thoughts and his will – we learn to live with him and to practise with him that humility of renunciation that belongs to the very essence of love. God made himself small so that we could understand him, welcome him, and love him (Homily for Midnight Mass, 25 December 2006). This Holy Infant, the Second Person of the Most Holy Trinity, was born in Bethlehem (Matthew 2:1), in the "House of Bread," and placed in the manger (Luke 2:7), in a feeding trough for the animals, all to prefigure what he would later say: "Unless you eat the flesh of the Son of Man and drink his blood, you do not have life within in" (John 6:53). Yes, the Bread of Life was born in the House of Bread and placed as food in the manger. Yes, God made Himself small to become our food, to be our nourishment in the Eucharist, that by receiving Him we could become like Him. The mystery of the Body and Blood of the Lord is intimately connected with the Paschal Mystery and with the mystery of the Incarnation. It is this three-fold mystery that is presented before us every time we approach the altar of God, every time we are reminded of His greatness and our littleness. His greatness is shown precisely in his desire to become small for us. Few of us seek to become small for others, even for God; rather, we seek to become great for ourselves, and sometimes for another. But now and again we do find one among us who does become small for the Lord and today we celebrate one of those who is now truly great in the Kingdom of God. 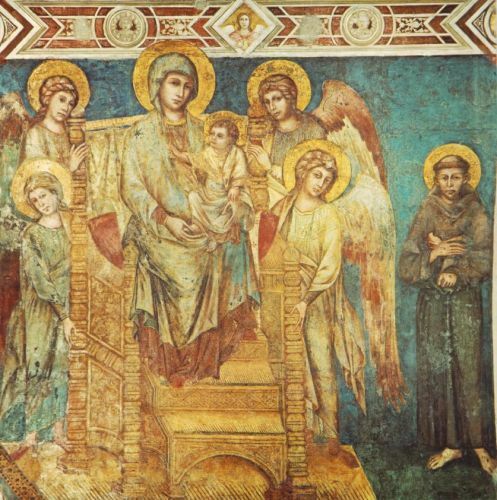 It was she, Saint Clare, who often referred to herself as "a handmaid of Christ, a little plant of our holy Father Francis [of Assisi] (The Blessing Attributed to Saint Clare, 5). By following the brilliant light of her example, may each of us become a little plant of Saint Francis that by following him would might following the Lord Jesus Christ whom he followed so well!